Instantly measures drum or rotor dimensions & Helps technicians quickly determine total indicated runout. Dial fast for rapid removal or slow for final surface finish & One-cut pass capable. You can read more about the BL500 by visiting the Hunter website. Hunter’s ACT (Anti-Chatter Technology)- equipped OCLH on-car brake rotor lathe virtually eliminates the buildup of vibration (chatter) that can occur when machining rotors at a fixed speed. 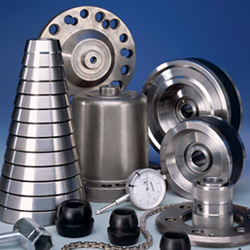 Wide selection of brake lathe packages, lathe accessories, arbor kits, special application accessories, measuring tools, inserts, tool holders and silencers to fit your specific needs. 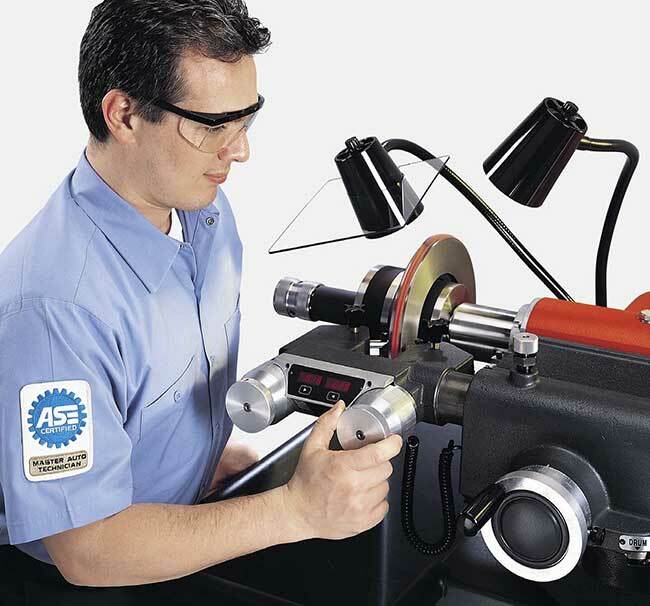 The Hunter AutoComp Elite™ On-Car Brake Lathe system keeps your brake service a cut above the rest. The AutoComp Elite™ Brake Lathe system was the first to introduce Hunter’s revolutionary Anti-Chatter Technology to provide a smoother surface finish. The AutoComp Elite™ Brake Lathe virtually eliminates the buildup of vibration (chatter) that can occur when machining rotors at a fixed speed. The AutoComp Elite™ On-Car Brake Lathe can service each rotor in less than nine minutes, and also utilizes exclusive precision machining and Hunter’s patented Variable-Speed Drive System to service rotors at the fastest possible speed without sacrificing quality. 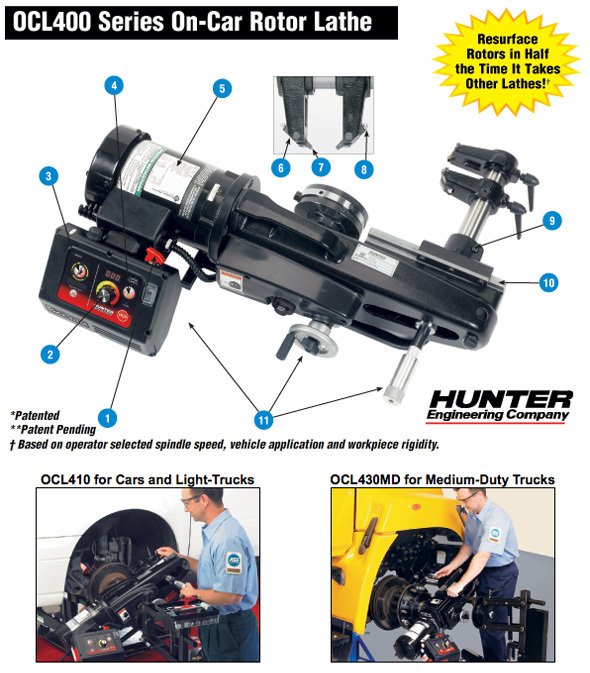 The Hunter QuickComp® On-Car Brake Lathe system keeps your brake service a cut above the rest. 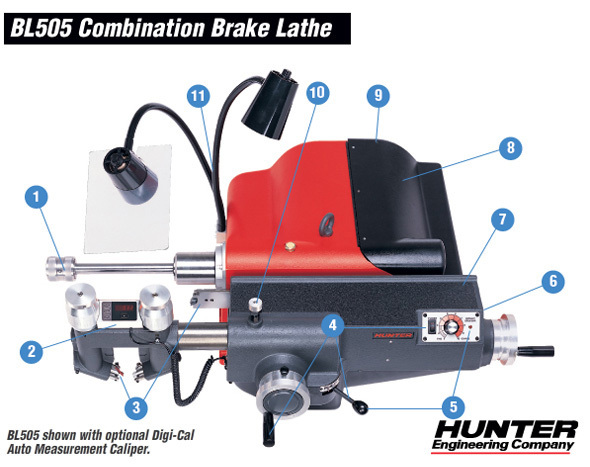 The QuickComp Brake Lathe system was the first to introduce Hunter’s revolutionary Anti-Chatter Technology to provide a smoother surface finish. The QuickComp Brake Lathe virtually eliminates the buildup of vibration (chatter) that can occur when machining rotors at a fixed speed. The QuickComp On-Car Brake Lathe can service each rotor in less than nine minutes, and also utilizes exclusive precision machining and Hunter’s patented Variable-Speed Drive System to service rotors at the fastest possible speed without sacrificing quality. We are the largest distributor of automotive repair equipment in the Northeast, serving Albany, Utica, and upstate New York from Orange County to the Canadian border; and Vermont, Western Massachusetts and Connecticut.